Compassion Over Killing exposed Tyson Foods again in this new ghastly undercover investigation showing horrifying cruelty to animals. You are going to be blown away by the ruthless mistreatment of birds you see in this video. It’s deplorable conduct that no human being in their right mind could ever support or justify, not even the employees doing it. In a Tyson supervisor’s own words on hidden camera after he killed a bird by stepping on his head, he said, “…you can’t let nobody see that…because it’s inhumane standing on his head and letting him suffocate.” For more than 10 years, undercover investigators have caught their employees torturing animals. On their website, Tyson Foods has the audacity to write, “Ensuring the health and well-being of the animals and treating them responsibly and with respect – it’s simply the right thing to do.” If by “responsibly” and “with respect,” they mean punching, stomping, kicking, throwing, smashing, and torturing chickens, they’re doing a spectacular job. What does Tyson Foods management do every time they get caught beating up animals? They claim ignorance, express disgust, fire employees, and continue to make millions of dollars. Don’t be fooled. It’s systematic. The company should be shut down and the executives should be held accountable. The federal government needs to intervene. Please contact the House and Senate Committees on Agriculture and demand action. Also, contact your U.S. Representative and Senator and urge them to introduce or support legislation to hold these animal abusers responsible. How has the public responded to this horror show? They punished Tyson Foods by buying more of their chickens than ever before. 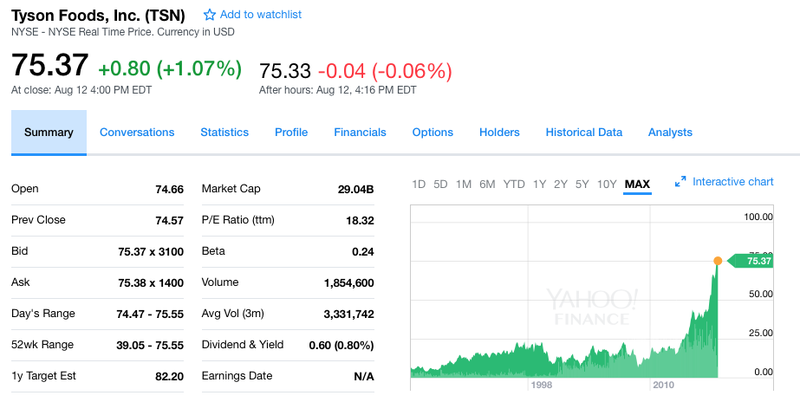 On Tuesday, Tyson Foods posted their highest per share earning in the company’s history and their stock hit at a 52-week high. This notion that we are winning the battle against animal agriculture is malarkey. We are not winning. We are getting crushed (for the chickens, literally) as I documented in this article. The number of chickens killed for food every year is going up, not down. Simply because there is a new vegan restaurant or bakery in your town, new vegan options in the store, or a lot of people at a VegFest does not mean the world is going vegan. People need to know the animal agriculture industry is winning and trillions of land and marine animals are being confined, abused, and slaughtered. We are making progress in some areas but we are not winning the battle for farmed animals. Everyone who cares about animals needs to get involved, do more, recruit others, think strategically, innovate, conduct or read research on best practices, and measure impact if we want to significantly reduce the number of animals killed every year for food. Tyson Foods has a long history of vicious cruelty to animals. Please click here to tell Tyson Foods what you think of them crushing live birds with their boots and punching birds in the face. If these abuses are caught in one undercover investigation after another, we can assume it’s going on in all of their factories all of the time. Please tell everyone you know to never buy dead animals from this nightmare of a company. Please use your voice! This is stomach churning. I’m sending it out to hundreds of people on my list. It’s upsetting to know that this keeps happening. Sometimes this all feels so overwhelming, but I was just informed of a group that has posted wonderful billboards against animal abuse in Times Square and the Javitz Center in New York. (http://www.befairbevegan.com). Clearly, we need much more of this and other efforts. I don’t meant to co-opt your message re Tyson, but instead add some encouraging news that there are so many of us trying to stop animal abuse. Outstanding. Thank you for your activism! The people in this video are spiritually bankrupt and some, if not all of them, may be demoniacs. They deserved to be fired (ten in total), but those who replace these thugs might be just like them. Think about the type of people who would normally take jobs like these. One answer would be for Tyson to install surveillance cameras in work areas, but it begs the question as to whether the company would bother monitoring them. All you can really do is pray for the innocent creatures. Its quite possible that Hell is all that awaits those involved. Thank you for your post. Actually, there is a lot more people can do than pray. They can stop eating animals.